If you intentionally write a bad check in New Jersey, you will not only face financial consequences for your choice, but you may also face legal consequences and be prosecuted criminally for check fraud charges. What may seem like a quick fix at the time to solve a problem or get something you want, can lead to jail time and significant fines if you are convicted of check fraud in New Jersey. Whether you found yourself facing check fraud charges due to hard financial times, gambling, a misunderstanding, or any other reason, it is important to invest in a knowledgeable criminal defense lawyer who can mitigate further legal consequences in your life and protect your rights. If you or a loved one has been charged with writing a bad check in New Jersey, do not go through this battle alone. The attorneys at our firm have successfully handled a myriad of cases for clients charged with check fraud, forgery, theft by deception, and identity theft in Camden County and throughout Southern New Jersey. With years of experience, Attorney William Fay and our team understand the seriousness of the charge you’re facing and we are prepared to put our skill and dedication to work for you. Contact us today at 609-832-3202 for a free consultation with an attorney who can answer your questions and if you so choose, provide aggressive defense representation. If you write someone a check or authorize an electronic funds transfer when you know the bank will not honor it, you can be charged with check fraud, also known as passing a bad check. In New Jersey, a person charged with check fraud is presumed to have known the check would not be honored if they did not have a bank account with that bank, if the bank refused payment due to insufficient funds, or because the account had been closed. 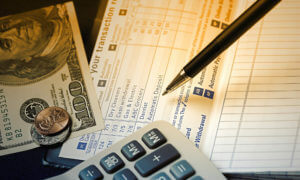 Further, the recipient of the check must have attempted to cash it within a specific number of days after receiving it and you must not have tried to correct the problem within 10 days of receiving notice. What is a postdated check? A check that indicates a future date is know as postdated check. Essentially, postdating a check means you are writing a check that cannot be cashed until the date indicated on it. Since you are clearly documenting the date upon which the funds will be available to the receipt, this is not a violation of New Jersey Check Fraud Laws. The distinction between writing a bad check and writing a postdated check is extremely important, as the former is considered a criminal offense and the latter is not. A prosecutor simply cannot prove beyond a reasonable doubt that you didn’t intend to honor a postdated check when you provided it to the recipient. This is one of the critical elements that must be satisfied to obtain a conviction for a check fraud offense. The penalties for check fraud in New Jersey are dependent on the how much the bounced check was worth in a specific case. If you knowingly write a bad check for under $200, you can be charged with a disorderly persons offense, which carries up to 6 months in jail and fines of up to $1,000. If the check was for $200 or more, but less than $1,000, it is a fourth degree indictable offense. If you are charged with fourth degree check fraud, you can be sentenced to up to 18 months in prison and be ordered to pay fines of up to $10,000. Knowingly writing a bad check for at least $1,000, but less than $75,000 is a third degree crime, which carries potential penalties of up to 5 years in prison and up to $15,000 in fines. Lastly, it is a second degree offense to knowingly write a bad check for more than $75,000. If convicted, you may face up to 10 years of imprisonment and fines of up to $150,000. Charged with Check Fraud, Where will my Case be Heard? If you or a loved one has been arrested for check fraud, the decision you make next about your representation can truly spell the difference between a positive or negative result. It is important to seek legal representation in any criminal matter, but writing bad checks cases, like other financial crimes, can be very complicated. Getting your check fraud checks dismissed or minimizing the consequences requires the skill and experience of a seasoned attorney who knows how to conduct discovery thoroughly and make sophisticated arguments relating to the evidence and your intent or lack thereof. For additional information, contact our local office now at 609-832-3202. Consultations are free and confidential.